Jean enjoying the day on Mt Washington. What began as a meeting between Redline Guiding owner Mike Cherim and local Justice of the Peace Jean Lee about cross-referring each other for officiation duties, ended up as a discussion about guiding in the White Mountain National Forest. This, as Mike learned, was something Jean had been doing in the area for the past four years. 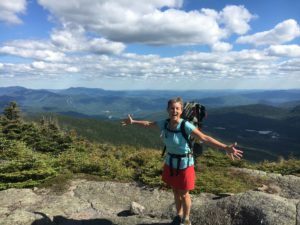 She had been bringing people to the summit of Mt Washington in winter, guiding alpine ski tours, and more. Mike also learned that Jean Lee, like himself and the rest of the Redline Guiding team, was passionate about the mountains and about hiking them. She is a hiker and skier at heart, like Mike. Her joining us seemed like a natural fit. 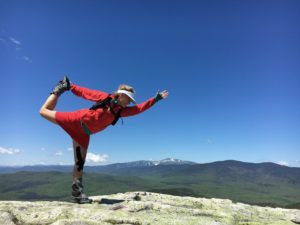 As such, please welcome the newest member of the team: avid hiker, mountaineer, backcountry skier, and NH Justice of the Peace, Jean Lee. Did we tell you she loves hiking. Introduction: Jean is student of life, forever reading, learning and exploring. 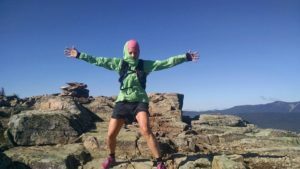 She can found on summit peaks, in Latin America (yearly trips), on the slopes, in her vegetable garden, at yoga, on a mountain bike, or Feng Shuiing her home. Jean and her husband, Scott, are forever building things; their home, their land, or a new idea. She is a student naturalist of all things outside but mostly things to eat; edible plants, flowers, and mushrooms. She studies and practices Ayurveda and has a MS from the University of Utah. 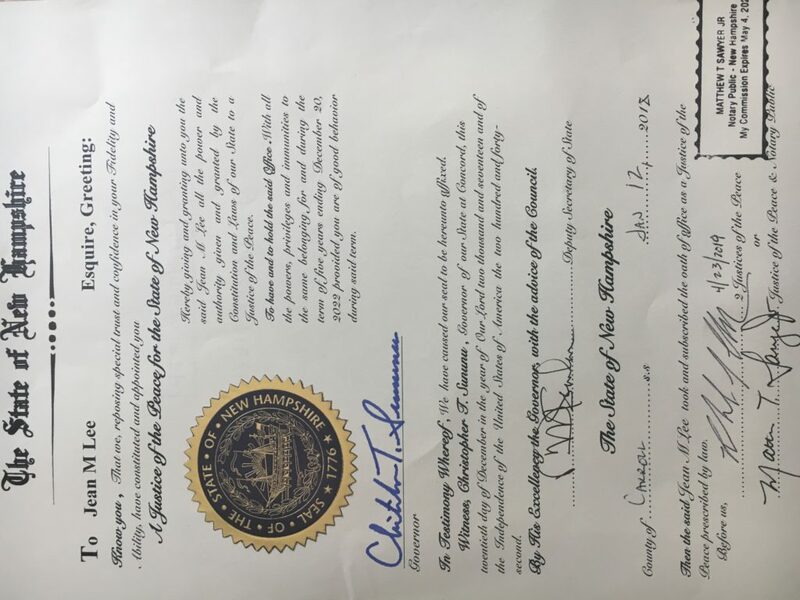 Jean is a NH Justice of the Peace and has a busy officiating business. 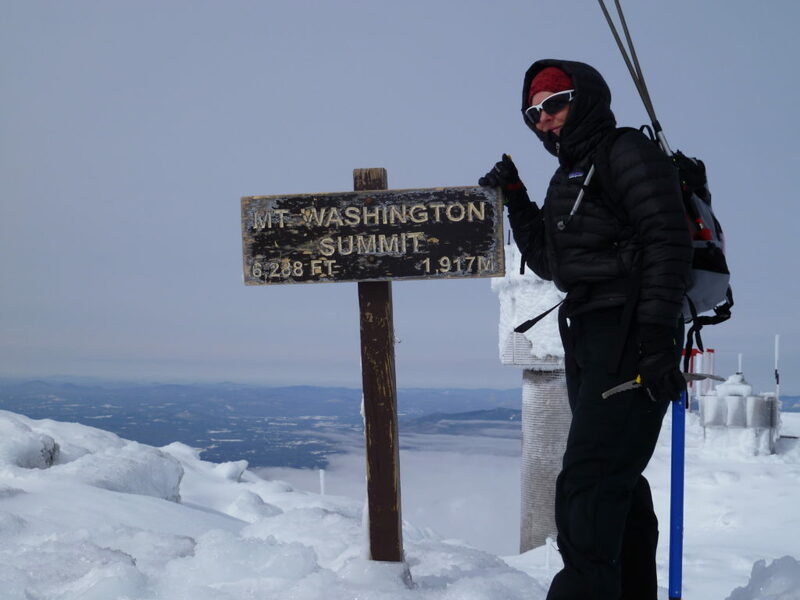 Résumé: Guided Mount Washington winter trips mountaineering and skiing for four winters. PSIA Level 1 ski instructor for 10 years for NET and Attitash in both Nordic downhill and alpine. Ski Patroller, Solitude and Brighton for 4 years, and at the Snowbird Clinic for 4 years, as an EMT. Backcountry Skier in the Wasatch, Salt Lake City Utah for 16 years. NH 48 4K. Rock climber with hundreds of recreational climbs in the US. Paddle boarded the Grand Canyon twice. Mountain biker having completed two 100K races, the Mt. Washington Hill Climb, numerous short triathlons, and 3 adventure races. AMC Crew ’83-’86. Certifications: Past-EMT, CPR/AED, AIARE Avalanche Level 1 (Avy 1), PSIA Level 1. CorePower Yoga. More coming soon. Welcome to the team, Jean!